The quilting workshop/course was wonderful, exhausting in the extreme, but jolly good. I spent Sunday afternoon stitching up my nine blocks. I found that tiring too, as one patch was too small so I cut another to replace it. Oh the thinking I had to do..
I’ve been laying it out on my bed. The idea is to not only having a pleasing look to the quilt but to make sure if possible that no two pieces the same touch. Now I used 10 fat quarters not nine, as the little Cath Kidston dogs was too small to be a full fat quarter, so it was slightly easier to do that bit, but then I had an aversion to having the dogs and the teacups the wrong way up. I was so tired by Tuesday that a not only was a little nap in order, but I also slept eight hours at night. Other than that this week we have been having a tidy up. Now we agreed to have a big tidying session on Wednesday in the kitchen. Virtually every work surface was covered in something, clean somethings, but cooking was getting impossible. I start to empty a cupboard, clean it, put things back and clear the work surface. Mr E concedes he doesn’t need two coffee machines and we agree to put the one we don’t use in the glory hole under the stairs, which we do. Nice big space on work surface. Mr E, then informs me that everything else is mine and he is done. Well it wasn’t… and he isn’t! I cleaned and tidied and then placed all his stuff in one place, which I can say occupies quite a lot of space. I suppose he might finally clear it….. They never mention the sharing of space when they talk about life in retirement do they? Wondering if we dare tackle the dining room next? 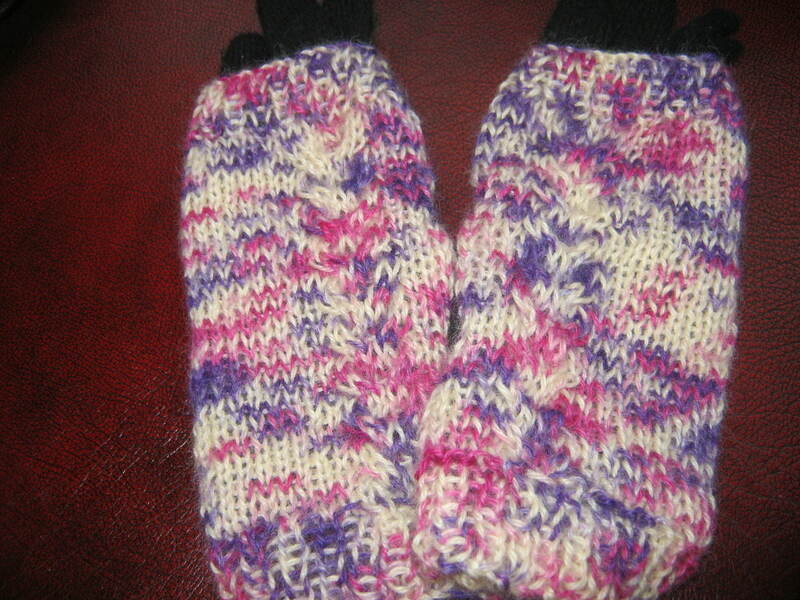 Meantime I finished knitting my fingerless mittens. Not certain I get the point of these, so I have used them in conjunction with a pair of black gloves, and the result was quite cosy. The colours are rubbish really, this is real wool, so the white is cream etc. The wool comes from a Wensleydale sheep, which is good to know. But talk about yarn chicken, there was precisely 8 inches left when I finished. And meantime I have started more knitting. I found some yarn with a pattern with it in the bedroom. I actually have yarn in quite a few places, but I have decided to start with that which is cluttering up the top of my pine chest. The thing is I have no idea why I bought six balls, I almost wonder if I intended making two things not one. Anyway I have decided that with that quantity I clearly intended to make the jumper for Little Miss F. I worried that the yarn was too babyish but actually I think it is pretty rather than babyish. Is she going to hate this? So what are your plans for the weekend. I am making some Celery and Stilton soup, and if the rain isn’t too bad, maybe some time in the garden before the gardeners come next week, did I mention what nice chaps they were? And a walk..
Do please join in the natter/comments, my favourite bit as I never get tired of saying. Our internet is still a big problem, not helped by a certain gentleman dropping the router on the floor and cutting it off completely for an hour whilst I uploaded photos. Anyway today we have internet, still a long way to go before we have new equipment, so if I vanish for a while, you’ll know the reason. Just read the kitchen tidying para to Mr, he laughed as I knew he would and said it sounds like you need a shed! I think why stuff a coffee machine in another area, why not sell or donate? I need (we) an update on if he does clean up his pile. It’s life from the front. I like the yarn for a little girl it looks perfect. I also need you to know I baked cheese scones on Friday “It’s been over a year…. A Shed? The man needs a warehouse! We can’t sell the coffee machine, it would give Mr E nightmares. Imagine if the other broke, then where would he be? Congratulations on baking the cheese scones, you can’t beat homemade soup and a cheese scone for lunch. Did I mention the old computer dump? Ha! That is funny, I love tales of Mr E especially as we’ve met. But maybe don’t tell him as if he knows got an audience he might become even ‘funnier! I had written a birthday pledge card to make monthly cheese scones, as I’ve made them for years but you know that thing when you wonder aloud about it then find no cheese or not enough flour? It kind of fell by the wayside, making it into a task. The card stuck on the fridge actually became very pale in the sunlight of the heatwave! So I recycled it and it didn’t go down well…..
Just having a catch up in blogland and your quilt is looking beautiful and it has all come together very quickly. I do like the colours of your new piece of knitting – my granddaughter would love it. The clearing up and clearing out these days seems to be a never ending part of life! Thank you for your kind comment. The problem with two people having a lot of interests is they do create what the other perceives as mess. Hello! Your patchwork is looking fab! I’d definitely be the same about dogs and teacups being upside down. Ha ha! Sharing space! Hubby is having another few months break between contracts – or he may have retired, who knows? But I’m definitely having trouble sharing space, He’s covered the kitchen table with videos we’ve taken over the last 30 years and is putting them together in compilations on something more modern. So I’ve had to clear the table in my sewing room to cut out fabric and pin together my patchwork where I’m actually supposed to do it! I know it’s so unreasonable when the chaps want our space. I have to really give myself a good talking too, when what I see as a great big mess is his WIP and of course vice versa! There is a lot here to comment on so I’ll first say you have done a wonderful job of your first quilt. It depends on what you are going to do with it as to the batting in between. I’ve always used cotton batting because I machine quilt mine. Others who hand quilt use wool batting. I am no longer a fan of poly in any form, not even for a pet quilt. Just don’t care for it. If your fabric is all cotton, and you are not hand quilting, then find one that feels the right weight to you. From all the quilters I’ve asked, it’s a personal preference. As for the jumper, Miss F should be delighted with those happy colors. Love them. I think it’s that time of year we are all sorting out. We (my daughter and I) just emptied the food cupboard and put everything on the counters and washed the shelves. I’m reading this as they dry properly before loading what we have not tossed out due to age. Next comes the freezer and maybe after my nap a little more time in my sewing room. I sew and purge something each time I go in there. Lots has to go from age. You do know that a retired husband is a wife’s full time job. I’ve never worn fingerless gloves and rarely wear any glove at all. Guess I lost too many to bother any more. Thank you so much for all the good advice. I think I shall go for cream now, especially if I can find one with the hint of a pattern. I will be binding it, I shall try to do a scrappy binding as that requires more learning. I used poly batting on the picture quilt I hand stitched for Miss F and it was not a good experience. A retired husband has certainly turned into a big job, especially since he got poorly. And he was always very very untidy. And another addiction is born. Once you start quilting, it’s not an easy habit to give up. 😉 I know a lot about husbands doing poorly. That’s when I started quilting too. The concentration saved me. Given what’s been happening for you, it’s no surprise the machine was neglected. I have no such excuse and should clean and oil mine. Hope you have chance for some sewing too. Hi Cathy, if it was my quilt I’d go as neutral as possible for the backing fabric colour – a nice cream would tie in all the colours and not ‘yell’ at any. And I know what you mean about having the patterns up the right way – to see dogs and teacups upside down would drive me nuts! You’re doing a really lovely job with it, keep up the good work! Thank you for the advice on backing fabric colours. I am beginning to realise you don’t just decide to make a quilt, there are lots of decisions to take along the way. Thank you also for your encouragement. Your quilt looks great, I always use cotton batting, I think it’s an 80/20 mix usually. It feels like it would make a really thin quilt, but it doesn’t, it’s lovely and warm and drapes nicely too. How much I pay depends on who it’s for! If it’s a charity quilt or a less special one I’ll use the cotton batting from the shop at Leeds market, if it’s special I’ll get Hobbs. Thank you for the advice on the batting. I had no idea there was so much choice. I am lucky in that I walk locally and if going further afield I have a car. I can see that fingerless mittens would be good on buses. Cathy, that layout is looking really good, and I’m with you on not putting upside down things which are clearly meant to be the right way up, to the point where I’ll sometimes buy extra to make it happen. But I don’t often buy a fat quarter with the express intention of squeezing the maximum number of pieces out of it; I know I’ll get the rest used up on a scrappy project… As for batting, this is my experience: polyester if you want very puffy quilting, it can look gorgeous but don’t buy the cheapest as it has a tendency to ‘beard’, which means the fibres poke through the quilt top. Cotton batting for most quilts; it’s flat, it’s easy to quilt and it drapes beautifully. Woollen batting if you want something both drapey and cosy, but be warned that if you ever end up hand quilting you’ll boil to death unless you do it in the winter, and you need to quilt it more densely than cotton. Silk for only the most amazing heirloom, expert work. Bamboo is lovely, cool and drapey, but it leaves white fluffs everywhere, even more than cotton. As for the kitchen clearing exercise, I have that ahead of me. My strategy in your position would be that as Himself has declared the remainder yours, you’re totally free to chuck out anything you don’t want, and he can’t complain. My own strategy is going to be that what he doesn’t see and hasn’t looked at in the 4 years we’ve been in the current house, he won’t miss if it goes either to the dump or to the charity shop. Of course, that means I have to do all the clearing myself, but I reckon that’s a small price to pay. Personally, I wouldn’t upscale again. I’d just give your husband a heater in his workshop! Thank you so much for your advice on the batting. I never knew there was so much choice. From the sound of it cotton is what would be best for me. Good luck with all your packing. You have a lot of work in front of you, but it will be nice to be in your new home. The jury is out on fingerless gloves it seems – I’m a wearer and a maker of fingerless gloves, though mine have fingers that go at least halfway along the finger length, leaving just enough to handle dog leads, keys and anything else I might be holding onto without fear of dropping and losing. Plus it tends to stay pretty mild here in glove wearing weather and I’m warm blooded……… Which I suddenly realise might be a relevant point for those who do and those who don’t. My daughter suffers with cold hands and needs full gloves for instance. 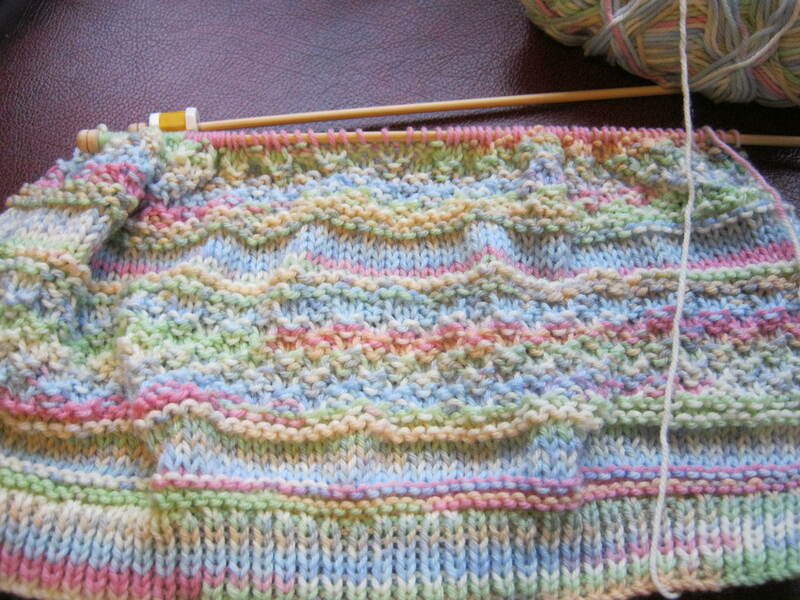 I really like the new jumper you are making, the colours are pretty and the pattern is too. I’m sure she will love it. You are right, I do get cold hands without gloves, so I am glad I have the black gloves to wear with my mittens. I rather like fingerless mittens, especially while shopping but maybe not when it is this cold. Jumper for Miss F lots like it is going to be very pretty. The only time I can see them being useful is when I am leading a walk and need to be able to hold directions. Your first quilt is perfect! And as for the wadding, I have had a pile of “junk” wadding to wade through, and it is the same stuff my mom put in my college spread that was merely hand tied, and it took 30 years to fall apart. Just saying….😄 I love the yarn for Miss F’s sweater, if she doesn’t like it I would wear it, though I guess we aren’t the same size so she’ll need to keep it regardless! As for the weekend, I am stitching like mad until I run to the Middles School to prep for the kids’ solo contest next week, then back to teach until supper, then stitch again until bedtime. Tomorrow we are doing a sewing service project at church, and I promised my server and myself, or I would be stitching more. I’ll take it with. Afternoon has more stitching and some makeup lessons. I think I’ll not have the urge to embroider for quite awhile after this! That sounds like a very very busy weekend. Hope all your plans come to fruition. Things have improved on the embroidery front, so fingers crossed! Thank you. I wouldn’t have known how to start if I’d tried this all by myself. I like Heirloom battings, but not sure what you can get locally. Polyester battings are too thick. cotton or wool battings are thinner and weightier. Design looks great! I would have to arrange the dogs in the right orientation too. OCD me. Thank you very much for the batting information. I had terrible trouble with 4 oz polyester batting because it was just too thick. I had often wondered why quilts I saw in exhibitions were so thin. I also got confused when I was cutting out the pieces and there was no mention of which way up they should be, the only consideration was how many pieces could be cut. Your quilt is going beautifully. Just don’t stress so much over it. Living together retired took us a while to get our “jobs” worked out and try to keep our “stuff” in our own space. He has one bedroom for his music(he plays the guitar) and computer. I have one room for my sewing. Then he gets the basement for his woodworking. The agreement is I won’t critisize his space and he can’t mine. Life is good. A basement for a workshop is just what Mr E needs for three D printing and milling. I really don’t see the latter as an indoor pursuit! Thank you for the kind comment about my quilt. Just saying what I think. Gets me into trouble some times. We are seriously thinking of upsizing. We down sized 17 years ago when we went from three sons living at home to one son at home. Now he’s gone you’d think we would have plenty of space, but we don’t. Not helped by my husband gaining new interests for which he really needs a workroom, apparently the workbench in the garage is too cold. And I would love somewhere for sewing etc. You have done very well to have made compromises. Thank you for the kind feedback on my beginners quilt. perhaps one of those Garden ‘offices’ would be a good idea, or a second garage with insulation. 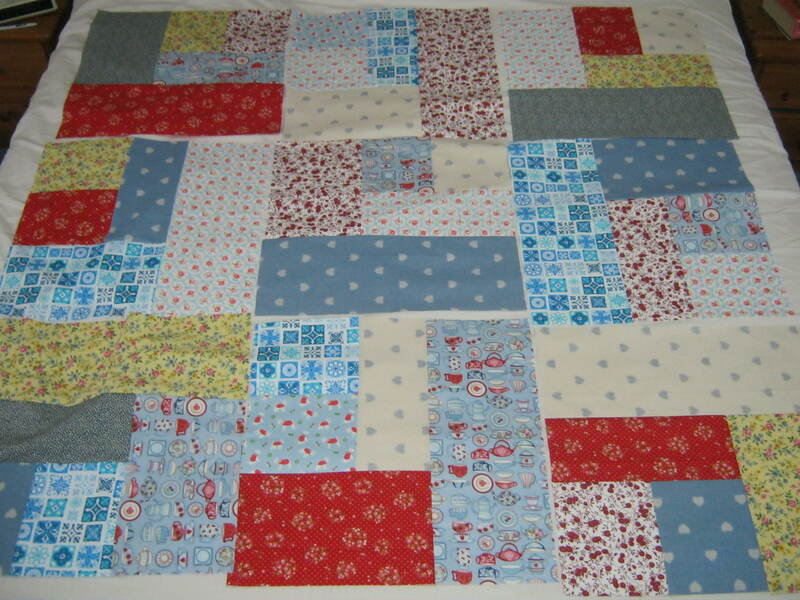 your patchwork layout looks lovely & balanced – bet you can’t wait for the next workshop in March! I love fingerless mittens and like them just to keep my hands warm, but fingers free. When a student, not able to afford heating bills, I used to wear them all the time, even in lectures because they were practical for holding a pen & taking notes lol. Miss F is going to love the new sweater – yarn doesn’t look babyish at all. As for you Spring cleaning and getting your kitchen straight – well done! The husband and I went to DIY shop yesterday and bought in paint & other supplies to redecorate the living room. It’s quite a large room (35m2) and we got wooden beams on the ceiling with (what were) white panels in between. 34 of them. Husband is tackling the walls, and I’ve volunteered to repaint the panels on ceiling. First have to wash everything first, so it’s going to be a back-breaking job. This morning, I washed about 1/4 of ceiling (beams & panels) and have painted 3 panels so far. Little & often is my plan. Hopefully it’ll be done by the end of Feb.
Oh my goodness that ceiling sounds like a huge job to me. Thank goodness we gave up on decorating and have someone in to do that. Don’t know what I will do when Dave hangs up his brush which he keeps threatening to do. Thanks for the comments on my layout, I am learning so much as I go along now, with a renewed respect for the wonderful quilts all the bloggers make. I don’t recall being cold as a student, I think it was all the walking and cycling. I have liked the extra warmth of the mittens in the car , especially as the engine warms up and the heating comes on. The quilt project looks so pretty! It’s the red that really makes it sparkle. Don’t fret too much about all the details–it’s not the last or best quilt you’ll ever make–just the beginning, so enjoy!! My husband and I need to get serious about the kind of organizing you’re doing–he’s as bad as I am about liking “stuff.” It’s overwhelming . . . . Thank you for the kind comments about the quilt. Our teacher calls it The Beginners Quilt. There is another teacher in the group and between them they are teaching four different quilts at the same time. Yes stuff, get’s you down in the end. I have spent a morning putting away random bits of paper in their most appropriate place. Also finishing things that were 99% done. It’s a problem mostly because I have so many different interests. This is it, I’ve finally caught up with all the blog posts I missed over Christmas and new year and I’m back in real time! Woo hoooo! I love love love the look of your quilt layout. I’m sure it will be amazing when it’s done. My parents are visiting this weekend and I’m going to take them to my archery club! Then we’ll have a nice afternoon tea at our favourite place and a wander around some shops. Fingers crossed it won’t rain! I bet you will all have fun doing the archery. I tried it once and was rubbish. My step granddaughter does it though and is quite good, I should add she does it through a re-enactment group which her biological Dad is in. Afternoon tea sounds very good too. You are in for a great weekend. It’s hard keeping up with blogs isn’t it. Glad to have you in real time. Don’t know about the sheep, should have asked when I bought the pack! How language changes, I’d never heard of another meaning for the cupboard that is used for everything! Trust Tialys. I use Hobbs wadding – depending on what I’m making either the polyester or,. more usually, the cotton one. I like the cotton because a) it’s cotton b) it’s low loft (not puffy) and c) when you wash it (once it’s in the quilt) it shrinks just a bit so you get a slightly ‘lived in’ look straight away – if that’s what you want. Fingerless gloves are useless if you are wearing them to keep warm and why else would you be? Translation: I don’t see the point in them either. I might have a go at sorting out my F2F blocks into a layout this weekend – see, you’ve inspired me – also, there’s another pregnant niece in the wings so I might have a go at a ‘quick’ baby quilt – although are these things ever really quick? I have lead a sheltered life, and never heard that before. Thanks for the wadding advice. Your quilt is looking grand – love the layout. I do enjoy hearing of what your resident House Elf gets up to – always gives me a chuckle. I think Little Miss F will love her jumper – the colours are really pretty – reminds me of hundreds and thousands. Have you ever made Fairy Bread with h and ts? I used to do that for kids parties and midnight feasts – must do it again! I’m off to Forde Abbey with a friend on Sunday to see the snowdrops, if they haven’t all been blown away! We will enjoy a pub lunch afterwards to warm us up. I have heard of fairy bread but never made it, sounds fun. Don’t think it would have gone down too well with my three sons. Your trip to Forde Abbey sounds perfect and the lunch afterwards- beware the beef wraps! It’s very blowy here too, and I would love to go a walk. Right now I am stuck in awaiting a delivery. The house elf has a lot to answer too! Ah no! My boys had to suffer Fairy bread for their sister! Just Bread and Butter sprinkled with hundreds and thousands and cut into shapes with pastry cutters. A bit sugary but no more so than jam and kids love it!